Every minute, 25-30 people are migrating to Indian cities from rural areas in search of better livelihood and lifestyles. If the pace of migration from rural areas to urban centres continues, Indian urban population is likely to reach 600 million by 2030. But before we brand this influx as a problem, it is critical to highlight that this event is likely to create one of the biggest concentration of consumer companies selling automobiles to apparels, and will contribute 75% of India’s GDP by 2030. As per Economic Survey 2016-17 estimates, an average of 90 million people migrated annually through railways between Indian states annually during the last five years. This is almost double the migration rate recorded during the first decade of the century. The National Capital Region in North India — Delhi, Gurugram, Gautam Budh Nagar — being the largest employment center recorded highest in-migration; while Uttar Pradesh, Bihar and Madhya Pradesh continued to be the net human resource providers for the rest of the country. Reasons and the types of migrants range, from a highly skilled IT engineer eyeing IT development centers in Bengaluru or Hyderabad to a farm labourer migrating from hinterlands of Uttar Pradesh to work at a construction site in Gurugram. One can visit a railway station or airport in mega cities to witness the epic annual home-travellers’ rush during festivals such as Diwali, Holi and Eid. Such influx presents a huge challenge for the cities at the receiving end, as the already strained city resources and infrastructure are being tested every day. Conscious of the scale of the migration, the centre and state governments in India have taken unprecedented policy decisions to spruce up the urban landscape of the country. Chaotic, stressed, complex are some of the adjectives used by media and urban planners to describe Indian cities. It is also equally surprising that over 10 new planned cities have been developed in India in the last 70 years — Bhubaneshwar (1946), Salt Lake City – Kolkata (1958), Gandhinagar (1965), Chandigarh (1966), KK Nagar – Chennai (1970), Navi Mumbai (1972), Noida (1976), Naya Raipur (2000), etc. In addition, numerous sub-city development projects have been executed in top 10 cities in the country. All these developments highlighted the need for holistic planning, criticality of infrastructure-link development and availability of employment opportunities in the near vicinity. With this thought, Government of India launched the Delhi-Mumbai Industrial Corridor (DMIC) Development Project a decade back. DMIC — the world’s largest infrastructure project with expected lifetime investments of $ 100 bn — aims to develop 24 industrial new cities between the Political Capital (Delhi) and Financial Capital (Mumbai). In Phase I, the work on infrastructure development of four such sites have already begun, and these sites are fast-emerging as important locations for businesses entering India listening to the clarion call of Prime Minister Modi under the Make in India mission. In addition, a new capital city sprawling across 217 Sq Km for the state of Andhra Pradesh at Amaravathi, was master planned by Singaporean master planners; while, architects from the UK have been engaged to develop landmark government buildings. City development authorities in Delhi are busy planning new world-class sub-cities at six locations within municipal limits. Privately managed cities Pallava (Navi Mumbai) and Magarpatta (Pune) are a model for the world to emulate. India’s soul resides in its culture and religion, and urban planners are addressing the need for improving the basic infrastructure and tourist facilities through policy interventions such as HRIDAY (rejuvenating 12 heritage cities across nine states), Swadesh Darshan (development of 13 thematic spiritual circuits), and PRASAD (development and beautification of 13 pilgrimage sites). Indian cities are amongst the densest in the world but the per capital space availability is also the lowest in the world. On an average, Mumbai offers 4.5 Sq mt space per person against 34 Sq mt per person in Shanghai. National think tank Niti Aayog and the Union Ministry of Housing and Urban affairs are reviewing the possibilities of increasing floor space index (from 1 to 1.5 at present) across 53 cities with a population above 1 mn. Government has been stimulating improvement in city infrastructure through a series of national initiatives such as AMRUT (drinking water distribution, transport infrastructure and open space creation), Swachh Bharat (solid waste management and public hygiene) and Smart Cities (command control centers, waste water treatment, road improvement, city beautification, etc.). Importance is being accorded to integrated land use and transport planning. For instance, the new metro rail development policy mandates Transit Oriented Development (TOD) to promote compact and dense urban development along metro corridors to catalyse urban transformation. Delhi has decided to allow FSI of 4 around metro rail corridor under the TOD policy. Monstrous traffic jams in cities like Delhi, Mumbai and Bengaluru are well-known. Construction of new roads, flyovers and under-passes have lagged the increasing vehicular density. Union Minister for Road Transport and Highways Mr. Nitin Gadkari has painted the ever-rising sales for passenger car, two-wheeler and commercial vehicles as the biggest professional challenge, as road development is a relatively time-consuming and slow process. While, “Moving People, Not Cars,” is the mantra to handle the intra-city urban traffic; Mr. Gadkari is working relentlessly to lay new roads and expressways for inter-city passenger and cargo traffic. Over 300 km of metro rail lines are operational in seven cities across India, 600 km are under construction in 12 cities and over 500 km of projects are under consideration. Bus rapid transit system (BRTS) projects in 12 cities are under different stages of construction and eight more cities are set to take up BRTS projects. Ministry of Road Transport and Highways through its ambitious project dubbed as Bharatmala is planning to construct 28 new ring roads and 45 bypasses around important economic centres such as Pune, Bengaluru, Delhi, Gurugram, Indore, Lucknow, Nagpur, Vijayawada, among others. These projects are likely to resolve the problem of pollution, traffic congestion and road fatalities. The capital city Delhi has two operational ring roads, and a third ring road is being planned. Besides expanding its metro rail network, Delhi is also planning a new Regional Rapid Transit System (RRTS) with trains running at 180 km/hr to nearby towns such as Meerut, Sonepat and Alwar, providing a faster exit mode to future workforce travelling to the city. 158 km and 8-lane Outer Ring Road in Hyderabad has positively transformed the experience of commuters, real estate market and social infrastructure of a city touting to be the next big IT destination of India. Land market in India is speculative in nature. Partners in city development — Real Estate developers, hoteliers, educational institutions, retailers — often complain about the high land value and cumbersome approval processes making project uneconomical. State governments are contemplating reduction in stamp duty, land use conversion charges and making the approvals for projects time-bound. Experiments such as voluntary land pooling of over 13,350 ha of land in Amaravathi city (Andhra Pradesh) is a well-appreciated land acquisition process for urban development. 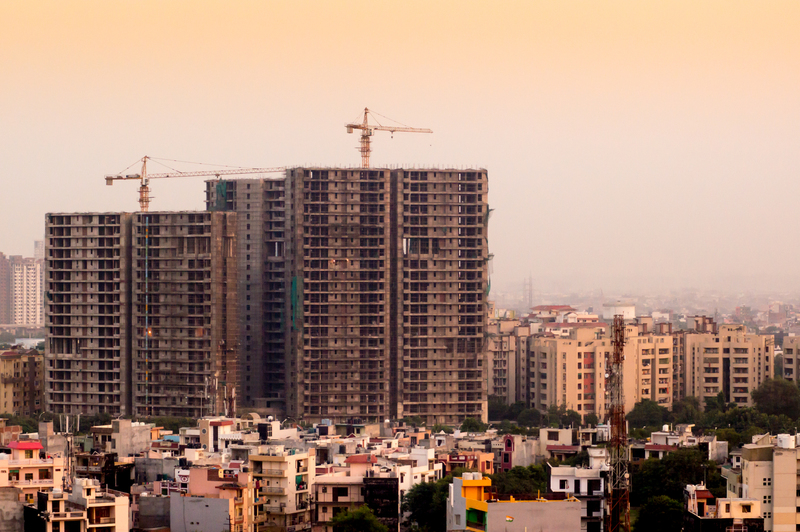 There is a greater need for the government departments and public-sector units to auction land parcels to unlock the development potential of cities. Laudable efforts are being made by the Indian Railways through monetization of Real Estate potential of 400 railway stations and auctioning of land parcels by Railway Land Development Authority. Indian government has also taken cognizance of shortage of affordable housing stock in cities by permitting interest rate subsidy on home loans and PPP model for projects to develop 20 mn new units by 2022. Indian cities are evolving faster than at any point in our history, putting them on the cusp of a major transformation which, if managed well, could lead to unprecedented economic growth and prosperity for all. With a development focused government in power, planned and sustainable urban development looks like an achievable target.